Isn't it true? Boys are a whole other species some days. At least that's how I feel when dealing with my son. However, the one thing I have discovered is generation after generation, boys love the same things. Our new stamp set Boys will be Boys encompasses just that. Check out this cute card I came up with while crafting with my friend this week! LEGO! What kid doesn't like LEGO? Growing up, my brother was a LEGO maniac and now my son is just as fanatic. I love that I can create something so perfectly suited to him, or any boy at heart! I coloured in the blocks using the new Blendabilities markers. A trim of our new cotton ribbon completes the card. I can't wait to use this set in my scrapbooks. 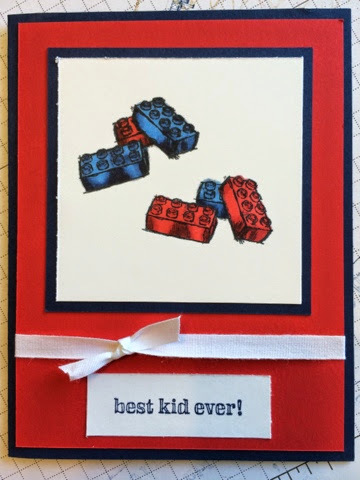 I can totally envision LEGOS lining the bottom of a page focusing on B's creations! There are so many other great images to this set, stay tuned for some more ideas!